BERKEBILE 2+2® STODDARD SOLVENT... is mineral spirits with the solvent capability proven effective in cleaning all metals, ferrous, and non-ferrous. 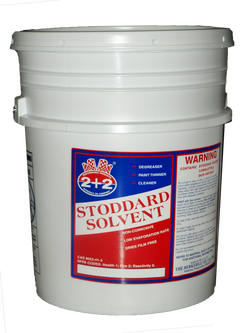 BERKEBILE 2+2® Stoddard Solvent is an excellent cleaning agent for machine parts. It removes grease, carbon, and oil-coated areas. It is not corrosive to most metals and has minimum evaporation loss. Cleans metal without leaving residue. BERKEBILE 2+2® Stoddard Solvent is recommended for most industrial cleaning and can be used in paint and protective coating formulations, dry cleaning, polishes, wood treating, charcoal lighter, and de-greasing operations. It is ideal for preparing metal surfaces for painting. It can be applied by dipping, brushing, or spraying, and it should be washed off with hot water. Wear protective clothing, protect hands and face from vapors, mist, or liquid BERKEBILE 2+2® Stoddard Solvent. Also good ventilation should be provided.